Many tourists around the world prefer to spend their holidays in the Greek islands to restoring their activity and reviving their bodies to prepare for the new routine life upon their return, and this choice not disappoint their expectations ,where the luxurious islands resorts amid white sand and attractive beaches , including the island of Crete, the largest Greek islands by population. Out Of The Blue Capsis Elite Resort located in the central of the Greek island Crete amid botanical gardens and perennial trees spread over an area of 176,000 square metres, and overlooking a wonderful view of the Aegean Sea at a site near all facilities of life on the island, is about 20 minutes from the international airport of Heraklion ,which received daily 25 flights from various European cities, is just several minutes away from the Aghia Pelagia market which is the largest fish markets there. Accommodations in the resort distributed on two main buildings ,as well as three other areas for those who likes to accommodation in bungalows chalets or villas . Rooms are located in two buildings and vary in size from 60 to 90 square metres and the price starts from 190 to 260 dollars depending on size and location, the suites and villas are located in special zones on three parts, all of which overlooking the sea, each suite or chalet have a private pool, either the villas have a Jacuzzi and a swimming pool in front of the sea. Out Of The Blue Capsis Elite Resort , which is one of the best European five-star resorts ,has a great list of restaurants to satisfy all tastes, where featuring great eight restaurants, the most important of which is Knossos restaurant which serves Greek & international cuisine, and can accommodate 920 tourists at one time through two rooms connected to each other, the restaurant is characterized by its quiet colors and old crystal chandeliers, as the majority of its walls of glass for tourists to watch what around them of beach and gardens, also El Greco restaurant near the lobby of the hotel and serves a variety dishes for different events and celebrations, sometimes serves Italian dishes and once Spanish and others as appropriate, and accommodates 260 tourists at one time, in addition to H2O Aqua Fusion restaurant ,featuring Asian cuisine and located on the main swimming pool, also Red Pepper Mediterranean restaurant which serves as its name the Mediterranean Basin countries dishes, and Poseidon Fish Taverna restaurant located outdoors on the beach, near the fishing village, which is dedicated to fish and seafood of all kinds, and other many restaurants such as Raki Cretan restaurant and Safran a la carte restaurant . The resort offers to its visitors a variety of services close of it such as the zoo' Mini-Zoo' , established in 1995 and has expanded slowly until become include large numbers of animals such as monkeys, ostriches, kangaroos and the rare species of birds, there is also a great place dedicated to organic plant cultivation ,and breeding pets called : Biological Cultivation on an area of 25 acres square , it provides 80% of the needs of the resort such as herbs, vegetables, flowers, fish, rabbits, dairy, honey, olives ,thyme, watermelon and many others, the tourists enters this place to see how to grow these fruits and how to take care of it , as they can also buy some of it cheaply . There are other areas around the resort such as Botanical Garden ,dating back to 30 years ago, the time of the creation of the resort, and contains trees ,aromatic plants, waterfalls, lakes and fountains as well as decorative elements as marble statues and a number of classic houses, in addition to the types of turtles and birds. Among the activities of the resort " Out of the Blue " in the island of Crete diving excursions with instructors, and Yachting trips around the island, there is also an integrated health center of skin care and body through 10 rooms and a dedicated room for the sauna and other for steam and other for Turkish bath, and for children there are open spaces for games and swimming pools for children, theaters and entertainment shows , along with babysitters for children and special meals. 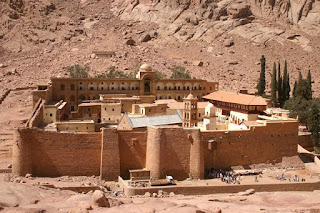 The majestic Sinai Mountains embrace one of the oldest monasteries in the world, Saint Catherine's Monastery, which is located at the top of an inhabited area in Sinai, 1600 meters above sea level, surrounded by a group of the highest mountains in Egypt including Mount Catherine, Mount Moses, and Mount Safsafa, and features a mild climate summers, very cold winters where snow covers mountain peaks. Saint Catherine is the largest nature reserve in Egypt in terms of size, amounting to 5130 square kilometers, it is also a tourist destination attracting crowds of travelers from all over the world to visit religious monuments, safari in the desert and mountain climbing, the monastery is a unique piece of art that combines Arabic mosaics and inscriptions in Russian and Greek and frescoes. African city granted by nature everything to become a charming town, with the presence of heights covered with green, the coasts of the Atlantic and Pacific oceans, the famous harbour ,Table Mountain ,and its diverse history all of this make it one of the finest and most famous cities of South Africa, it's the charming city of Cape Town. South Africa's third-largest city in terms of population, according to the 2007 Census, inhabited by nearly 3.5 million. It is the capital of Western Cape Province and South Africa's legislative capital. 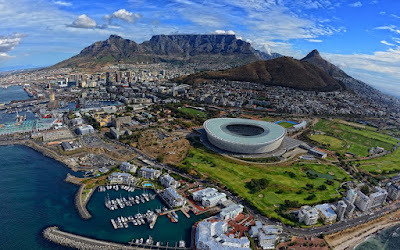 Cape Town was originally a Dutch ship harbour which sailing to East Africa ,India, and Asia, the town emerged in the 15th century, and has been affected by a long history of different cultures such as the Dutch ,Asian ,African and Muslim culture to made it a multicultural place with a special character. 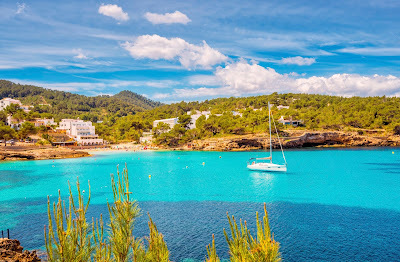 The sun-drenched Mediterranean island of Ibiza in Spanish is one of the Balearic Islands, offering visitors beautiful beaches, wonderful accommodation opportunities, natural scenery, and many possibilities to enjoy that, as many reasons to make it your next summer destination. Discovered it. Ibiza is rather small, which means you will be able to cross the whole island from north to south and from east to west in a single day. You may see the sunrise on the beach in the morning and go to the other side of the island to watch the sunset in the evening. Rock climbing is certainly not the first thing that comes to mind when you think of Ibiza, but a lot of the cliffs makes it an ideal destination for mountaineering enthusiasts amid breathtaking views of the world's coolest beaches.